The Olive Garden Peach Iced Tea is a refreshing non-alcoholic drink that is very popular at the restaurant. You can make the Olive Garden Peach Iced Tea at home. Everyone goes to the Olive Garden to enjoy eating Italian-family style. If you go there for a summer lunch, you will probably want something light and refreshing to drink, like iced tea. The Olive Garden offers you a choice of iced teas that go very well with summer lunches. One of my favorites is peach iced tea, although it doesn’t appear to be on the Olive Garden’s menu anymore. However, you can easily make this iced tea and enjoy it at home. The Olive Garden uses Monin’s gourmet syrups to flavor several of its drinks. 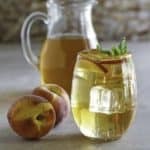 Using Monin’s peach syrup is an easy way to make this peach iced tea, but if you prefer to make your own syrup with fresh peaches, you can. I’ve also discovered two other products – Kern’s Peach Nectar and Torani Peach Syrup – which also make a delicious peach iced tea. 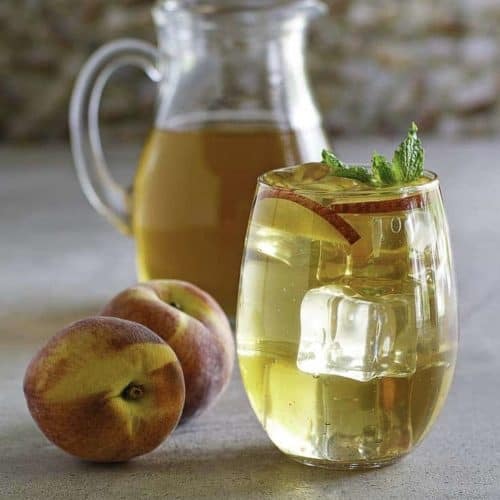 There is something extra refreshing about this iced tea, and there is no reason why you can’t enjoy fresh homemade peach iced tea all through the summer. It adds a perfect, peachy touch to outdoor barbeques. The Olive Garden is offering a variation on this tea called Bellini Peach-Raspberry Iced Tea, which also sounds delicious so I have provided instructions for this tea also. A good ratio of tea to water is 3 tea bags to 6 cups of water. Use your favorite tea. Let the tea bags steep for approximately 5 minutes. If you do not use one of the 3 pre-made syrups, place 2 cups of water and 1 cup of sugar in a medium-sized pot. Heat the water until it boils, and then turn off the burner. Place the sliced peaches into the pot. Steep the peaches for about 30 minutes strain out the teaches, and you will have the syrup. 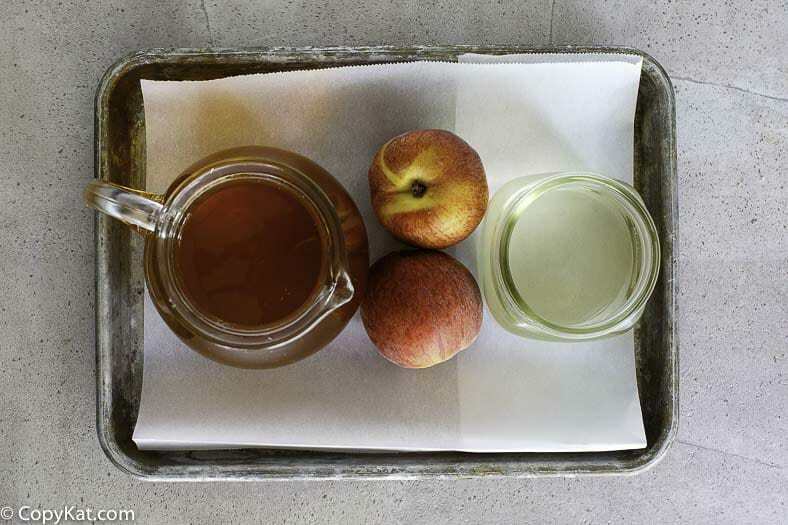 After you prepare your iced tea, refrigerate the peach syrup. 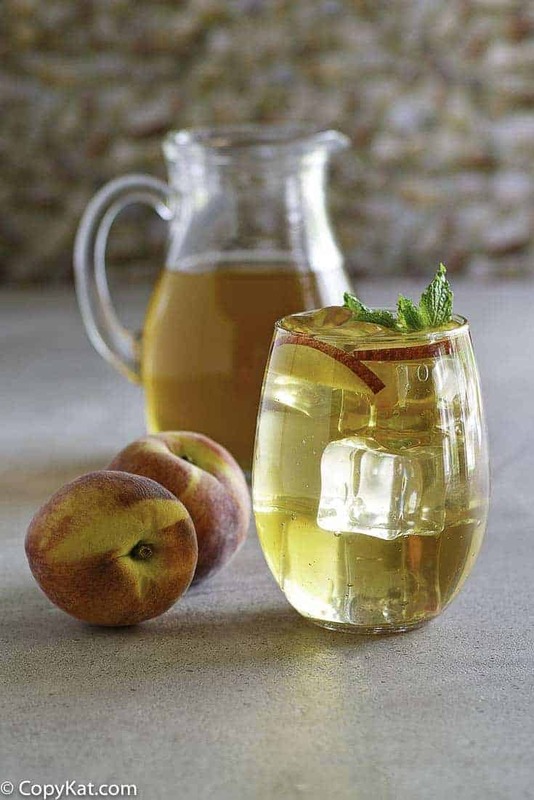 Combine 8 ounces of peach syrup and the 2 quarts of brewed iced tea together. Stir well. Serve with slices of fresh peaches if desired. I really like peach! Thank you for sharing the recipe! I can’t wait to try this recipe. This is a great way to cool off! Can I use sugar substitute and if so, what would be the desired amount? I am new to being diabetic so sugar substitutes confuse me something awful. What type of sugar substitute do you prefer to use? Nice recipe have to try it. Peach syrup is also excellent in iced matcha (green) tea too! ooo, I gotta try this! This sounds delicious. Thank you for your creation. It’s going to be amazing. I hope you enjoy the peach iced tea. I liked this, I made some sat on my porch listening to Vivaldi’s Summer while I smoked my pipe.